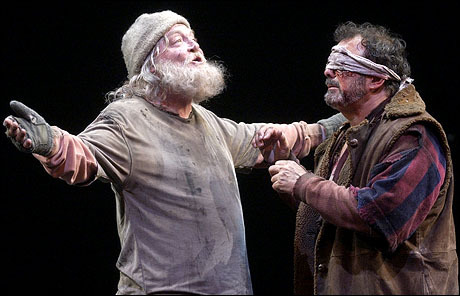 Stacy Keach and Edward Gero in the 2006 Goodman Theatre production of King Lear. For centuries after Shakespeare wrote King Lear, interpreters refused to accept the play’s desolation and lack of redemption. Nahum Tate gave it a happy ending in 1691, and for 200 years a redeemed Lear and the Earl of Gloucester would peacefully retire while their good children, Cordelia and Edgar, marry and rule a unified Britain. As late as the start of the twentieth century, preeminent Shakespeare scholar A. C. Bradley lectured that Lear had reached transcendence through his suffering and died happy. Even though the play contains the bleakest line in all of Shakespeare—Lear’s “Never, never, never, never, never,” as he holds his daughter’s dead body in his arms—Bradley insisted on a Christian moral to the story. 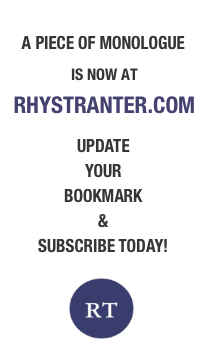 Today King Lear is recognized as the greatest tragedy in the English language, less brilliant than Hamlet but more profound and prophetic: “Humanity,” the Duke of Albany laments, “must perforce prey on itself, Like monsters of the deep.” There is no god or justice in the pre-Christian world that Shakespeare invented for Lear. Stanley Cavell’s justly famous essay “The Avoidance of Love” captures the paradox of Lear for modern audiences. “We can only learn through suffering” but have “nothing to learn from it,” he writes.